This group program is limited to 20 women max, so I'm able to really get to know you, your business & your vision and empower you with everything you need to get the absolute most out of this experience. Before Business Clarity Accelerator, my business was a happy idea. Now, I have a clearly defined, thoughtfully designed market niche which services, and solves problems for, my perfect-for-me clients. BCA smartly, and effectively, peels away excess concerns, uncertainties and mental roadblocks. This process reveals the clear and successful path to your passion, your business. It was so powerful being really true to myself when answering Cailen's thought provoking questions. Thank you Cailen, once again, for the clarity! "Before Business Clarity Accelerator, I was trying to run 3 businesses and feeling really overwhelmed. I also felt that if I quit any of it I would be a 'failure.' As I learned more about what truly works for me and brings me fulfillment and how much value I have to offer, I started to value my self worth and show myself more self love and self care. This was a huge shift at age 60, after a lifetime of not valuing or acknowledging my own worth. This shift feels life-changing and I know it will have huge benefit in my business, as well." IMPORTANT: These bonuses expire DAILY, so the sooner you enroll the better if you want to receive these 5 Early Incentive Gifts! Imagine having your 2017 business goals accomplished or in the works by the end of February. I remember the very first time I invested in myself and my business. It was a BIG step for me to take, and it felt totally outside of my comfort zone. But, after seeing the results I got from it, I was hooked. I realized that EVERY SINGLE TIME I made a gesture that showed I valued MYSELF, the investment would come back to me multi-fold. Works like magic. I just started my business, Is BCA right for me? Business Clarity Accelerator is meant to increase the momentum in your business and fast-track your success -- especially if you're in the beginning stages. BCA is ideal for women in the first 2 years of their businesses who feel stuck, unclear and like they're not seeing the results they desire (and that they see other people getting in their industry). If you want to get your first (or next) clients with more ease than ever before and hit new milestones in your business (like your first $5K, $10K or $20K month! ), this program was designed for you. I'm Still Really Unclear about my Business, Will BCA Help? Yes! That is precisely why BCA was created -- to help you clearly define your business, who you serve and how you help them. Whether you have too many ideas or are drawing a blank as to what it is that you "really" do, Business Clarity Accelerator will walk you step by step through the process of finding, achieving and maintaining Business Clarity so that you can streamline your efforts, channel your focus + energy to the most effective places and fast track your success. What's the Format of BCA? Business Clarity Accelerator is a 6 week live (and intimate) group coaching program. Every week you'll receive a Clarity Lesson that includes an on-demand audio teaching, action sheets, resources and fillable templates. Every week there will also be a LIVE group Q&A call with Cailen where you can bring your questions and receive 1x1 coaching. BCA is designed to bring you the very best of both 1x1 support and group accountability. When you enroll in BCA, you also get LIFETIME access to a private, members-only Facebook Group for masterminding, collaboration and feedback. Will BCA Work for Me? While there are no guarantees when it comes to programs like this (or life for that matter! ), I can say that previous clients who have moved through BCA have experienced major wins (like landing new clients while in the program!) and truly remarkable results (like selling high-end packages during BCA which more than covered their investment), as you can see from the testimonials on this page! As with anything, you get out what you put in. If you commit to this program, complete your work, and make the most of the support and accountability available to you, I have no doubt that you will experience a real transformation during your time in BCA. WILL CALLS BE RECORDED? HOW WILL I GET THE LESSONS? All calls are recorded so that you can save them and listen back. Every week during BCA you'll receive an email on Monday morning that delivers that week's Clarity Lesson. Also, you'll have access to an exclusive members-only page where all the call recordings, action sheets, resources, fillable templates and bonuses will be available to you. How is BCA different from other programs? Unlike many other group coaching programs that run for months and months and cost multiple thousands of dollars, BCA is designed to be a Business Clarity Accelerator, first and foremost. That means all the lessons, course materials and resources have been carefully curated to deliver you the absolute most Clarity while still honoring and taking into account your life and business beyond the program. Simply put, BCA will deliver more results in just 6 weeks than most entrepreneurs see in a year. If you like quick results, the feeling of Business Clarity and unstoppable momentum to get you more clients and making more money than ever before fast, this program is for you. WHAT IS BUSINESS CLARITY? WHY DO I NEED IT? Business Clarity is knowing exactly who you are as a business leader, what you offer & why, and who you offer it to. It's feeling the cohesion and relatedness of everything you do, create, think and say. It's the synthesis of all that you are right now and all that you're becoming. It's that amazing feeling of knowing that you're on the absolute right track for you and believing in your inevitable success. I do my very best to select a weekly time for our live group call that works well for as many BCAers as possible. But, if you ever miss a call, all calls are recorded so you can listen back, and you can pre-submit your questions via our private Facebook Group, and I'll answer them first on the call. 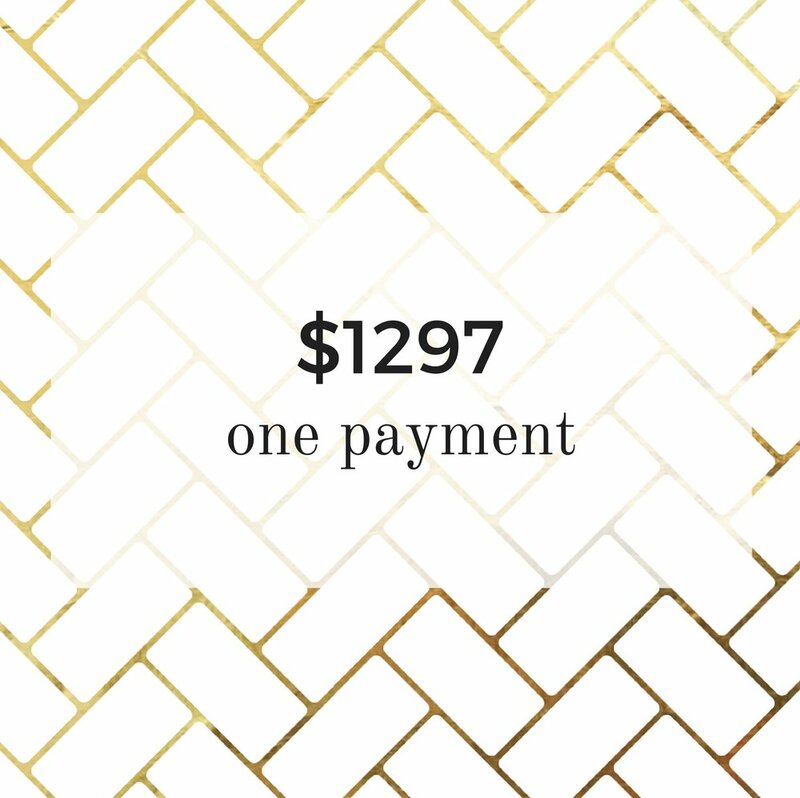 You can either choose to pay in full (a 1-time investment of $1297), or you can choose 3 monthly payments of $447. Upon payment, you'll receive immediate access to the BCA bonuses, so you can dive in right away! BCA Winter 2017 is open for enrollment January 4th - January 12th. The Winter 2017 program begins with Clarity Lesson 1 on Monday, January 16th. Get the Business Clarity you need to go from Stuck to Unstoppable in just 6 weeks! Lifetime access to a members-only Facebook Group where you'll receive support and accountability during BCA and continued masterminding and collaboration afterwards! This is an intimate group program of 20 women, which means you have the opportunity to have my eyes on your business and receive personalized coaching from me. If you get just one new client or sell one package, your investment in Business Clarity Accelerator could be covered! Thanks to my work in BCA, I've landed two awesome new clients, both of whom signed up for my longest package!! I'm really loving my work and the first client has used words like "life-changing, outstanding, invaluable and priceless" to describe her first sessions. The strategies covered in Business Clarity Accelerator are the same ones my 1x1 clients pay $6,500+ for! Let's get you Business Clarity, shall we?! Doors close at 11:59pm PT on January 12th or Sooner if the Program fills to the 20 person capacity. IMPORTANT: Early Incentive Bonuses expire daily, so the sooner the enroll the better! Cailen is super supportive & clear and very generous with her time. BCA has been incredibly clarifying. If you do the work, you can get so much out of it! My biggest win through the Business Accelerator was being able to identify what exactly my business is. I was able to move out of the “expensive hobby” stage of my business and really start speaking to my ideal clients. I honestly shutter to think of where I would be now without Business Accelerator! It has completely changed my life and my business. Before my business looked jumbled -- my offerings were too complicated, my client wasn’t defined, and I wasn’t quite sure where I wanted to take things. After Business Accelerator, my business is totally different. I now have simple, defined packages, a clear brand, and am able to target my ideal client confidently. Cailen has taught me not only how to center my business but to also have fun with it. When we approach our business with a mindset of abundance, anything is possible! I can hardly begin to say how awesome the Business Clarity Accelerator was for me! Prior to working with Cailen, I was - quite frankly - lost. I felt uninspired and drained by the business that I had built. Although I had created something which looked very successful on the outside, it didn't feel that way to me, and I was considering giving up. Coming in contact with Cailen has changed all of that. My vision for my life (and how I want my business to fit within that) is so much clearer. I now have confidence that I can transform my skills, passions and expertise into services which truly inspire and serve my tribe - while living a lifestyle I LOVE! Or, if you'd prefer to talk in-person, you can schedule a time to chat with Cailen about the program and what it could offer you here.